← British World War II Merchant Navy Campaign Medals. The British Library‘s collection of newspapers includes the British Newspapers Archive which is available online and free to search, but unfortunately costs to view the pages. If you choose to register you receive 15 free credits to start with or there’s a choice of packages depending on cost, time and pages viewed. I didn’t find the Family Notices I was looking for anyway and didn’t need to sign up right now. I started with my local library but they didn’t have free access to the British Newspapers Archive. If you are a member of the National Library of Australia (NLA) you can access the pages you found in your search of the British Newspapers Archive in their Canberra reading rooms. Another alternative for NLA members are their other e-resources which include overseas newspapers which are sometimes available for free or by logging in with your NLA Library Card. I found the newspapers for the United Kingdom included the Times Digital Archive 1785-2008 which is available online and free to NLA card holders. If that doesn’t help there’s access to the Gale News Vault which allows cross searching of the Times Digital Archive and the Illustrated London News 1842-2003 amongst others. I kept getting error notices and still didn’t find my Family Notices. I just searched the Illustrated London News instead and got much better results. Alas, it was still not what I was looking for, although the Times Digital Archive could well be addictive, like Trove and are both available through the National Library of Australia. I was able to save or print the articles I selected but it is for personal, non electronic use so it is not shown here. I gave up on my Family Notices and instead searched for Erith Explosion and found the Illustrated London News (London, England), Saturday, October 08, 1864; pg. 365; Issue 1281 and Illustrated London News (London, England), Saturday, October 15, 1864; pg. 376; Issue 1282. Another unfortunate explosion occurred in 1924 with photos entitled At Home and Abroad: Erith Girl Victims in the Illustrated London News (London, England), Saturday, February 23, 1924; pg. 300; Issue 4427. Among the girls who died are Alice Craddock, Ethel Pullen, Gladys Herbert, Stella Huntley and Doris Sturdevant which I include for the benefit of anyone who may be looking for them. 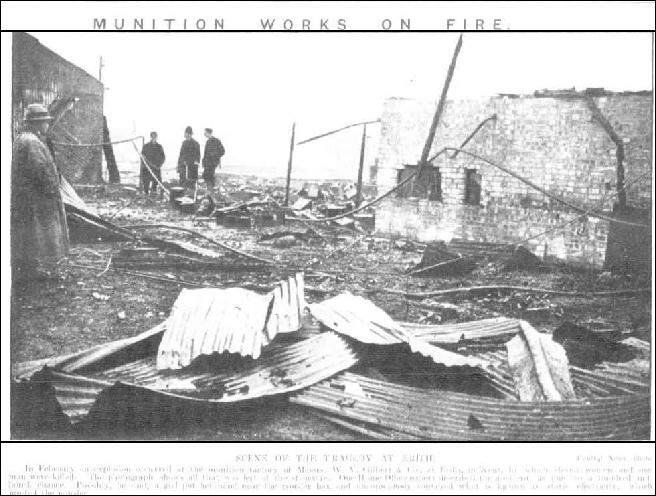 I was actually looking for bombing at Erith during World War II when I found an article about the 1924 Erith Explosion on Trove in the Adelaide Chronicle of February 23 & 29th, 1924 with this photo of the grim scene where 11 women and one man perished. No luck today with the World War II bombings of Slade Green/Erith where an incredible amount of bombs were dropped in the area. There’s a mind blowing Bomb Sight map of the bombs dropped during the London Blitz between the 7th October 1940 to 6th June 1941. Your able to search by town or even by street for Erith or elsewhere and marvel at how your ancestors ever survived. Bexley Burough’s Local Archives also includes photos of Erith, the War, family and local history information. The newspapers I want don’t appear to be available online as yet. However, fortune was smiling when I found the 1866 pictures of the Visit of the Prince of Wales to the Training-Ship Worcester in the Illustrated London News (London, England), Saturday, July 07, 1866; pg. 17; Issue 1379. Pity I couldn’t include the etching for you. A totally unrelated ancestor just happened to have trained on this vessel between August 1864 & August 1866 and would have been on board at the time, presumably. I had no idea it was actually at Erith as it was usually described as being the ‘Thames Marine Officers Training Ship as in this 1864 Trove article on the Royal Navy and the Mercantile Marine’. Thanks, for unexpected surprises! This entry was posted in British Library, British Newspaper Archive, e-resources, Merchant Seamen, Newspapers, Pictures, Research, Times Digital Archive, Trove, United Kingdom, World War II and tagged Australia, Dartford, Erith, Gale News Vault, Illustrated London News, Kent, London Blitz, Trove. Bookmark the permalink.